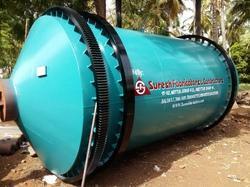 Prominent & Leading Manufacturer from Salem, we offer aluminium melting rotary furnace. Aluminium melting Rotary furnace was used for melting Scrap Aluminium by heating the material at around 1000 Degree celcius . We provide the Rotary furnace with all its accessories like Base frame for mounting the furnace , Bottom Rollers for rotation of the furnace , Horizontal Gear Box , Motor etc . Based on the customer requirenment and capacity the Furnace was designed. Firing of furnace may be by using Furnace oil or Diesel as fuel. Looking for Rotary Furnace ?